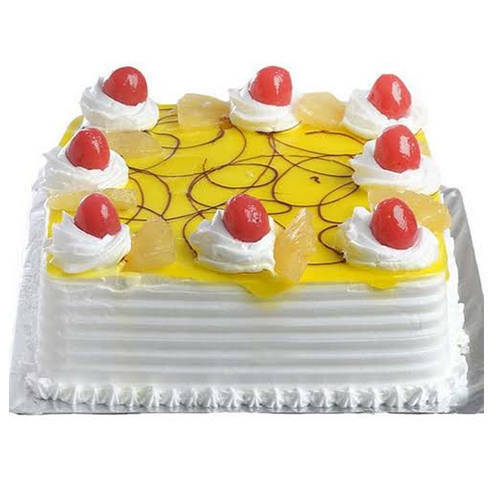 Make any party or event a grand success by presenting this Velvety 1 Kg Eggless Pineapple Cake. Let your guests have a great pleasure by taking a piece of this Bakery-Fresh 1 Kg Eggless Vanilla Cake. Enjoy every bite of this Appealing 2.2 Lbs Eggless Strawberry Cake with heavenly delight. Give your dear ones a happy time by presenting this Appetizing 1 Kg Eggless Black Forest Cake. Decorate your house with this gift of Pleasant 12 Red Roses with 1 Kg Eggless Pineapple Cake that will render a magical touch to your home. This Bakery-Fresh 2.2 Lbs Eggless Plum Cake from Taj / 5 Star Bakery is incredibly delicious for anybody to resist from tasting it.